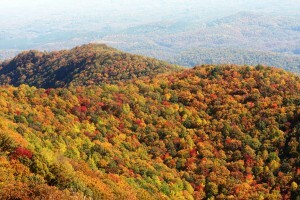 September 22nd marked the first official day of Fall this year, and evidence of the change in seasons is just beginning to take place on the southern crest of the Blue Ridge Mountains of Western North Carolina. A rolling sea of green trees is slowly transforming to a rainbow of color as the leaves on the hardwoods begin to change. Unlike years past, 2009s leaf season is expected to be one of the most beautiful to date thanks to all of the rain during this years spring and summer months. The rainfall should attribute to a more vibrant, longer lasting show of colors. According to Dr. Gary Walker, a professor at Appalachian State University, Western North Carolina has the highest diversity of tree species in North America. He explains that this diversity of trees, hardwoods in particular, lends itself to an extended display of color lasting from early October through late November. Pair that with large tracts of protected land through our national forests and parks, as well as citizens, developers and builders dedicated to preserving the natural beauty of the region and spectators are afforded stunning unmarred colorful panoramas that stretch for miles and miles. For more than one hundred years, residents of the Highlands-Cashier Plateau have been afforded front row seats to this colorful spectacle of Mother Nature. This year, they wish to share this very extraordinary time of year with their neighbors from near and far. The Greater Cashiers Area Merchants Association has taken great care in planning their first annual Leaf Festival of Cashiers Valley for the weekend of October 8-10. The weekends festivities will include live music, Artisan Festival, Tour of Homes, kid-friendly activities and so much more. For more information about this very special celebration of nature and community, click here. If you cant make it for that particular weekend, the historic villages of both Cashiers and Highlands offer dazzling scenery all season long, in addition to their unique brand of dining and shopping experiences. Its well worth the drive for an impromptu vacation weekend you wont soon forget! For more information about the Leaf Festival and area accommodations, contact the helpful staff at Silver Creek Real Estate Group at calling 828-743-1999 or via e-mail at info@ncliving.com.